The Seattle Department of Transportation (SDOT) wants you to know what’s in the works for the streets and sidewalks on North Beacon Hill. All interested neighbors are invited to a Project Open House at 6 p.m. at Beacon Hill International School, 2025 14th Ave. S.
Planned improvements include a new sidewalk on Beacon Avenue South, changes to the intersection at Beacon Avenue South and 14th Avenue South, curb bulbs at 14th and South College Street, and a new ramp on the Holgate overpass. Construction of the improvements is scheduled to take place starting next summer. 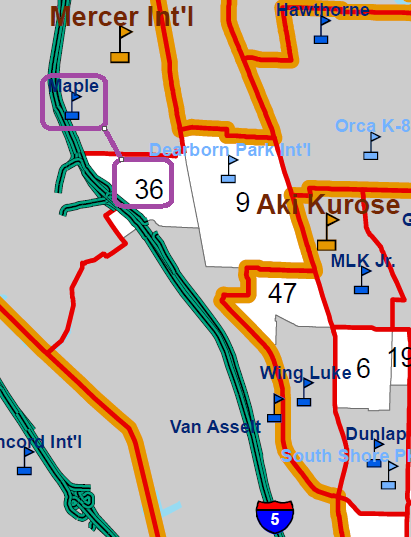 In both their latest boundary maps, Seattle Public Schools wants to kick Mid Beacon Hill out of the official Maple walk zone (an area so close to a school that bus service is not even provided) and instead make our kids bus miles to school every day. Photo by Kei Noguchi via Creative Commons/Flickr. Seattle Public Schools is scrambling to avoid overcrowding. They’ve introduced a proposal to move kids around called “Growth Boundaries.” Kids would be bused miles instead of attending a school two blocks away or another school less than a mile away. We must encourage complete transparency and work together as a community to keep Beacon Hill awesome. SPS needs to be thoughtful and engage our community more in the process before any decision is made. Even if you don’t have a child in the Seattle Public School system, you are affected by this proposal. When families travel farther from home for school, they have less time to invest in our community. We have fewer eyes on the street and less of the daily interaction that makes our community so strong and interesting. We all benefit from the volunteer efforts and the small businesses started by families with kids. When families are forced to send their kids outside of the neighborhood they’ve invested so much time and money in, they may feel less committed to the community and may even decide to leave. Property values are affected by reference schools. Our homes may be worth less after this proposal is implemented because potential buyers are holding out for a better or more convenient school. Please sign up now to “Walk the Boundaries.” It’s another important way to share feedback about the proposal. Feedback is due by October 1. Download the map for the school attendance area(s) you will review. Each map has a grid to use as a reference point when you submit your observations and suggestions. Mark any issues on your map and note the reason, or note that there are no issues. Enter your results in the online survey. Please complete the survey one time for each school attendance area boundary you review. While you’re “Walking the Boundaries,” remember: the City of Seattle has invested millions of dollars in Safe Routes to School and Neighborhood Greenways. The SPS proposal doesn’t take any of that valuable infrastructure into consideration. Betty Patu; School Board President, Kay Smith-Blum; Sally Bagshaw, Chair of the City Council committee responsible for the Neighborhood Greenways; and any other elected or appointed officials you believe may be interested in this proposal. I’m confident we can help Seattle Public Schools find a solution to the problem that works well for communities. I’m confident that Beacon Hill will work with Georgetown, Mt. Baker, Seward Park and other South Seattle neighborhoods to create a plan that meets the needs of students while maintaining strong communities. We must. Cars do not stop for pedestrians here as often as they should. Photo by Wendi Dunlap/Beacon Hill Blog. How do you navigate our neighborhood? Do you stroll the sidewalks, amble the arterials, bike on Beacon or hike on Hanford? Perhaps you’re no pedestrian; do you prefer to press the pedal and speed on Spokane? We can all get along if we understand and follow the rules of the road–and maybe add some Beacon Hill courtesy and respect to our commute. 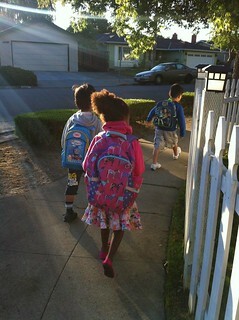 As this lovely summer continues, remember that everyone has a right to be safe as we travel through the neighborhood. Next time you see your neighbor struggling to cross Beacon Avenue, remember to stop (not slow, not rush past so she can go behind you) for her. That gaggle of small children crossing McClellan on bikes and scooters? Whether they’re crossing on the Greenway at 18th in a marked crosswalk or 20th at the curb, stop and allow each and every one of them to reach the opposite curb safely. Special heads-up: if you’re not stopping for pedestrians at the crossing on Forest and Beacon Ave, you might end up with a big ticket. The Seattle Police Department is considering an undercover pedestrian sting operation in that area–that slow stroller-pusher may just be a police officer. (Not that anyone reading this would ever speed past someone pushing a stroller across Beacon Avenue.) SPD may also choose to go with a good old-fashioned marked police car near the library to encourage drivers to slow down (obey the speed limit) and stop for pedestrians. This intersection is a well-known danger zone and SPD is taking community concerns seriously. That means that McClellan and Beacon have maximum speeds of 30 mph and all side streets have maximum speeds of 25. Notable exception: the Beacon Hill Greenway, which runs from I-90 to Lucile Street and has posted speeds of 20 mph. Bottom line: slow down and be alert for people trying to cross the street. It’s responsible, it’s respectful, it’s neighborly and it’s the law. If you’re interested in making it safer to walk/bike to school/work/shops in the neighborhood, consider contacting Feet First and/or Beacon BIKES for ideas. Melissa Jonas has been regularly walking the not-so-mean streets of Beacon Hill since 2003, first with a dog and now with a preschooler. She’s the Chair of the North Beacon Hill Council, which meets next on Sept 10, 7pm in the library community room. All opinions are her own. Do you have something to say? Send us your own opinion pieces on this or other Beacon Hill-related topics. View 14th Ave. S. dangers in a larger map. This unsafe stretch of 14th Ave. S. should be improved, says Mark Holland. The intersections at 14th Avenue South and College and Walker need crosswalks. I live on the corner of 14th Avenue South and College. On August 6, the night of the rollover accident, I was on the street within 10 seconds of the impact which was deafening. I had to pull my car away from the wreck as it burst into flames, after stopping the passenger from fleeing as the driver ran down College toward the greenbelt. In the last wreck at this corner, five teenagers in a stolen Honda roared up College eastbound toward 14th, crashing into the curb, taking out two trees, up onto the sidewalk where they nearly hit a group of kids on the corner. The suspension was damaged and they all jumped out of the moving vehicle which rolled up onto the sidewalk across 14th and landed against a retaining wall. The motor was still running and I saw there were no keys. I had to pop the hood and pull the plug wires to stop the engine. Every six months or so my neighbors and I have to deal with carnage on this corner. Luckily we have great neighbors around here. Any time something happens everyone is out on the street within seconds. Police and Fire respond within minutes. It’s a great place to have a disaster. Everyone does their part. I wish I could say the same for SDOT. The bicycle lane on 14th gets painted every three months, but the center yellow line does not. SDOT just painted the center line after the accident, but before it was barely visible. Cars speed on this section of 14th because it is engineered to be a speedway. Northbound Beacon traffic hits the “slip lane” (SDOT’s term) at 14th and takes the turn at full speed, bypassing the four way stop intersection, just as the traffic engineers designed it to. At the end of the “slip” lane the driver looks north on 14th and sees a green light three blocks down at Hill, and nothing in between. There is no cross walk, curb bulbs, signage or anything on 14th to tell drivers there is a lot of activity at College, or at Walker. I just had an application for a crosswalk at 14th and College turned down by SDOT. It costs $15,000 to install a crosswalk. More if you want curb bulbs. For $30,000 we could install crosswalks at College and at Walker in front of the store. SDOT said they did not see 20 people per hour cross at College, and the intersection is under bus trolley power lines, which is apparently a problem. Those are their reasons for doing nothing. For comparison our lovely “Greenway” just cost $420,000 for a little over two miles and there were no accidents recorded at any of the intersections affected by the Greenway, according to SDOT. Except for the weirdness at Beacon and Hanford, most of the Greenway seems to consist of lots of stop signs in inexplicable locations and bicycle stencils on a quiet neighborhood street. Other than that, 18th is the same as it’s been for the last 100 years: missing sidewalks, curbs, and gutters north of College. SDOT has the police reports. They know the accident numbers. Why is all the focus on an already safe Greenway, when we have truly dangerous roadways that are due to “bad” driving, but also due to “bad” traffic engineering, or lack of any engineering at all, like at College and Walker? We need crosswalks, curb bulbs and ramps with “Stop when pedestrians are present” signs at College and at Walker. 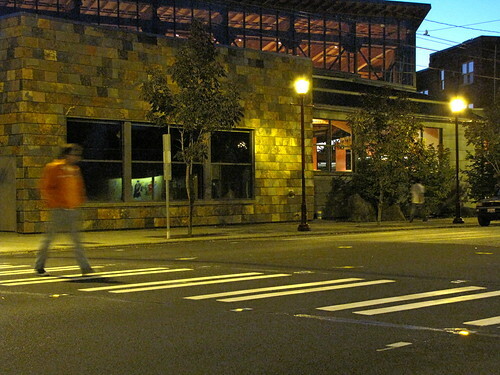 SDOT is installing crosswalks like this all over the city but there is not one on Beacon Hill. Why not? The “slip” lane has got to go. It sends cars speeding through the intersection creating conflict with traffic merging onto 14th from the four way stop. Often vehicles “slip” through in a train of several cars. If the first car accelerates, they all do, while tailgating. That is when the honking and screeching of tires happens at College where the northbound vehicles are moving 40+ mph. The vast majority of honking and tire screeching interactions involve a speeding northbound vehicle on 14th and a westbound vehicle on College turning in either direction onto 14th. Most accidents involve a northbound vehicle on 14th. The light at Hill is always green unless someone presses the button to cross. It simply draws drivers forward. Drivers think they need to make the light before it turns red, but it never changes unless a pedestrian pushes the button. Even the buses speed down this section of 14th. Maybe the light at Hill should be replaced with a yellow yield or crosswalk light with curb bulbs and a more visible crosswalk. What is the point of a 24/7 green light? Beacon Hill should be paying more attention to what SDOT is doing or not doing in our neighborhood. The thing to remember about SDOT is the Mayor pretty much has all the control. There is little the City Council can do except approve or disapprove the Mayor’s plans. Just like the rest of us. Mark Holland is a long time Beacon Hill resident, a founding member of the Jefferson Park Alliance (JPA), and served on the Jefferson Park Planning Committee (JPPC) during the North Beacon Hill Neighborhood planning process from 1998-2000. View Larger Map. The “slip lane” shown on the right in this satellite image is hazardous, says Mark Holland. Safe Kids Seattle, the Seattle Department of Transportation, Feet First and FedEx are starting a year-long partnership with Beacon Hill’s Asa Mercer Middle School, with a goal of improving safety and conditions for pedestrians in the area around the school. 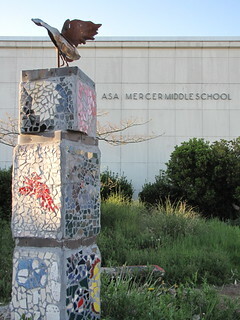 The kickoff event for this program is tonight (June 6) at 6 p.m., during the Sixth Grade Parent Welcome Night at Asa Mercer Middle School, 1600 S. Columbian Way. As part of the project, FedEx is presenting the Safe Kids task force with a grant of $25,000 for work throughout the upcoming year to improve permanent walking conditions for child pedestrians in the Asa Mercer community. The task force will create both environmental changes in the area, and educational campaigns to increase pedestrian awareness. The Beacon Hill Family Bicycle and Pedestrian Plan, a project of Beacon BIKES and the City of Seattle, has won a 2012 VISION 2040 Award from the Puget Sound Regional Council. Vision 2040 Awards honor real-life examples of sustainable growth and improvements to quality of life in Puget Sound communities. The Beacon Hill Family Bicycle and Pedestrian Circulation Plan has been designed as a ten-year plan to develop a network of pedestrian and bicycle routes to connect important and well-used locations with neighborhood greenways, cycle tracks, intersection improvements, and other solutions to increase safety for walkers and cyclists of all ages. 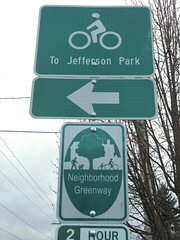 Among the proposals is a crosswalk and “median refuge island” at South Spokane Street and Lafayette Avenue South, a location that leads directly into Jefferson Park from a neighborhood greenway but is currently very dangerous to cross. 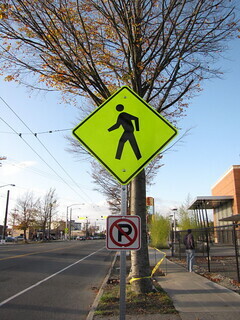 Mayor Mike McGinn today announced new funding for a Safe Routes to School project on North Beacon Hill. The project would install curb bulbs, curb ramps, and a pedestrian island at the complicated intersection of Beacon Avenue South and 14th Avenue South, near Beacon Hill International School. Other projects in the Safe Routes to School program include pedestrian improvements near West Woodland Elementary School in Ballard, and improvements near McGilvra Elementary in Madison Park. The $800,000 for the plan comes from the city’s Real Estate Excise Tax, which is required by law to go to fund capital projects such as these. A new sidewalk will soon make South Orcas Street a bit friendlier to pedestrians. The sidewalk is to be built on the south side of Orcas between 28th Avenue South (near the Chief Sealth Trail and Dearborn Park School) and 32nd Avenue South and will include ADA-compliant ramps, rebuilt driveways, and improvements to vegetation along with the new concrete sidewalk. However, there is some pain to come before the promise of better walking conditions. During the project work, starting September 4, South Orcas Street will be closed for 24 hours a day to eastbound traffic between Beacon Avenue South and 32nd Avenue South. There will be an open sidewalk on the north side of the street. Completion of the sidewalk project is scheduled for October 31. For more information about the Orcas sidewalk project, see the project’s website. We first wrote about this project when it was announced back in September 2010.